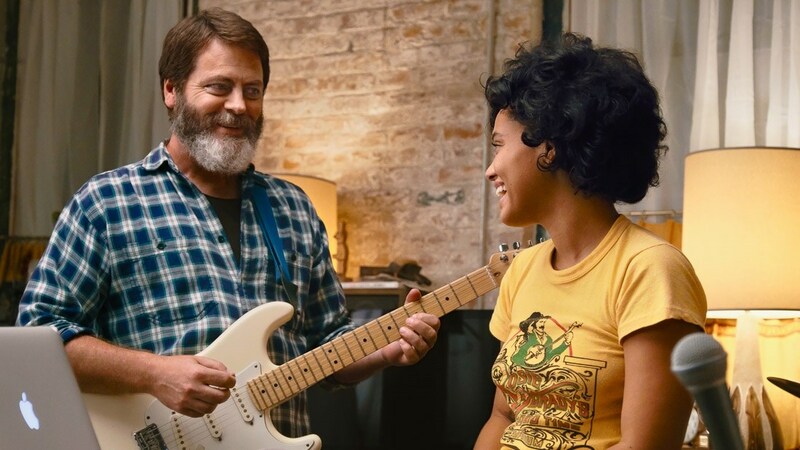 It's "jam sesh time" urges Nick Offerman's Frank in Brett Haley's sweet, low-key dramedy Hearts Beat Loud, one of the most popular films to emerge from this year's Sundance Film Festival. Offerman, known for his droll, everyman frankness that made him a Parks & Rec star, is unusually chipper and childishly eager, which takes some getting used to. But get used to it we do, as Frank jams out with his musically gifted daughter Sam (the delightful Kiersey Clemons) on their way to becoming local sensations. The third hugely successful film by Haley about starting over and finding a new lease on life (I'll See You In My Dreams, The Hero), Hearts Beat Loud is like a mini playlist of comfort tracks. It eases the mind and gives you a reason to smile; the troubles of its handful of Red Hook-based characters never stretch into anything resembling serious, and that's perfectly okay. Frank is a widower and a record store owner, still thinking about the musical career that could have been. His shoplifting mom (Blythe Danner, a Haley veteran at this point) keeps getting arrested and can't be left alone. His wife and stage partner died years ago in a bike accident, but her talent has obviously been passed to Sam, who is a natural at the keyboards and on the microphone. She's only days away from leaving for medical school, and all Frank wants to do is keep her home so they can continue to jam out together. With his business on its last legs, despite the support of his friendly landlord Leslie (Toni Collette), Frank is at a crossroads. Closing the store, Sam moving away...it's the end of everything musical in his life. But when a random jam session with Sam produces a fluttering love track "Hearts Beat Loud" that goes viral in a hurry, all of his dreams come flooding back. They aren't necessarily Sam's dreams, though, while other life complications get in the way. A somber air hovers over Haley's film as it deals with loss in a myriad of different forms; loss of a loved one, of dreams past, of a career. But it's balanced by laid back charms as chill as Frank's bartender pal Dave (Ted Danson), who is always looking for his next high. Love blossoms in the air between Sam and starving artist Rose (American Honey's Sasha Lane), and those bubbling feeling are what Frank encourages her to use as lyrics. Sam pours her heart out into the words while Frank crushes it on guitar. When he hears their song on some random Spotify playlist while buying his morning pastry, his excitement is infectious and sooooo anti-Offerman. This heartwarming confection is easy to take in because of its affable cast and a light-hearted script by Haley and regular collaborator Marc Basch. You don't have to concern yourself with the details of the music business; just sit back and watch Offerman and Clemons' beautiful chemistry together. Their scenes as father and daughter are soulful and real, but they click most while performing from Keegan DeWitt's catchy tunes. Offerman's musical skills are well known but Clemons's gifts as a singer are a surprise, making the case for her to not only get bigger roles but a true musical to show them off. A different movie would hit us over the head over the death of the record store business. A different, lesser film would make this a movie about Frank and Sam soaring to the top of the music charts. Another movie would dwell longer on the many hardships Frank has endured. Those are complications too deep for Hearts Beat Loud, thankfully. At its core this is the story of a father and daughter reconnecting over a shared love of music, and the genuine feeling this film creates is one that you'll want to keep coming back to.